« POSH NEW GRAND OPENING SIM & 50L SALE!! 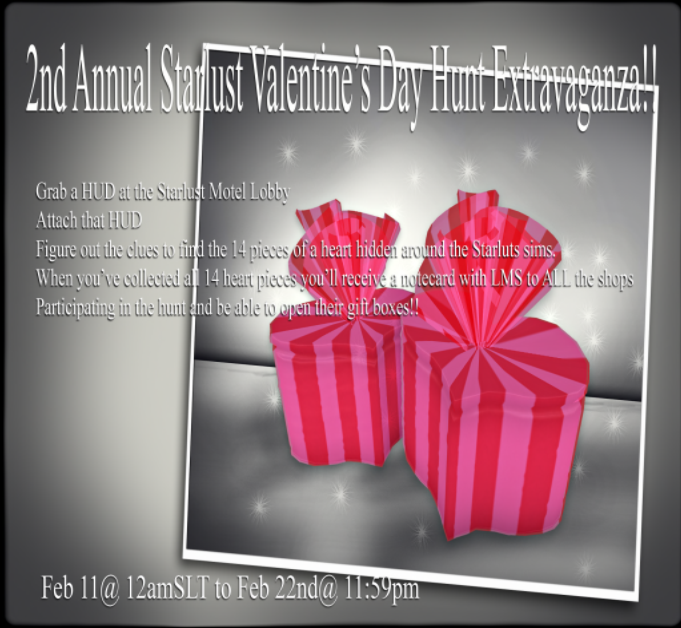 2nd Annual Starlust Valentine’s Day Hunt Extravaganza!! First you’ll need to pick up the HUD at lobby. Then follow the clues and fill in your heart pieces of the HUD and once you’ve filled in your broken heart return to the lobby and get the list of all the participating vendors. All vendors have their gifts in plain sight, just touch the heart shaped box and receive your gifts! PS. Join the I ❤ Starlust group for hunt hints. To quote the lovely Apatia Hammerer “need help? cheat via ❤ starlust group ims! !